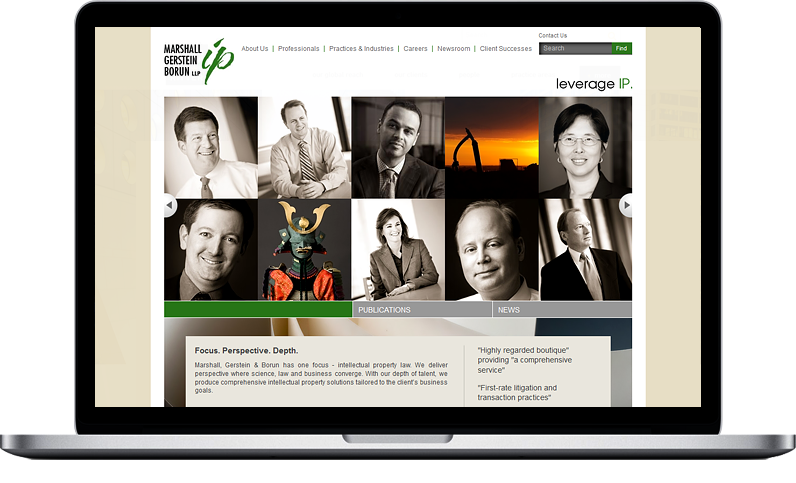 Marshall, Gerstein & Borun, a nationally recognized intellectual property firm, re-launched its website with a new, next-generation CMS created by Great Jakes. This first of a multi-phase effort was completed on November 18, 2014 and involved mostly technical improvements, the biggest of which was the implementation of Great Jakes’ Rainmaker CMS technology. The new website back-end provides the firm with some of the most advanced law firm web-marketing functionality available. These tools make it extremely easy for the firm to alter attorney bio and practice area content and manage an array of content types, such as articles, case studies, news items, podcasts, videos, PowerPoint presentations, blog posts, and social media feeds. The website’s existing design, which was created by Greenfield Belser, was largely preserved during the re-launch. Future phases of this project will include improvements to the design as well as the addition of responsive design mobile technology. The current design was adjusted to more prominently feature attorneys’ accomplishments and information and to accommodate “Attorney Microsites” – a unique approach to lawyer bios that was pioneered by Great Jakes. Attorney microsites essentially are small websites for each attorney that fit within the firm’s larger website. Information-rich attorney microsites help Marshall, Gerstein & Borun attorneys demonstrate their particular expertise.